Fire pit burners are complicated pieces of equipment, yet essential to your fire pit. If you’re not a professional or, at the very least, familiar with gas-fired devices and their burner assemblies, you may be at a loss when trying to figure out what burner is best for your individual situation. 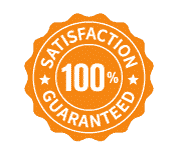 While you always have the option of hiring a professional to install your own gas fire pit burner, a little know-how can become a cost-saving option. A fire pit burner is used to create and manipulate the flame in a gas fire pit. The gas itself will be either liquid propane or natural gas, with many homeowners choosing liquid propane due to its convenience and portability options. Most homeowners cringe at the idea of ripping up decking in order to tap into an existing natural gas line. And some homeowners do not even have a natural gas option, leaving liquid propane as the obvious choice in most circumstances. Gas fire pit burners come in various shapes and sizes, including rings, octagons, linear styles, “H” and “tree” styles, and more. Some offer double and triple burner rings, which create more flames in your fire pit while minimizing the need for a more floor space. Burners feature heat- and rust-resistant metals, such as stainless steel or aluminum, with brass fast becoming the go-to option in terms of durability, longevity, and lifetime cost. 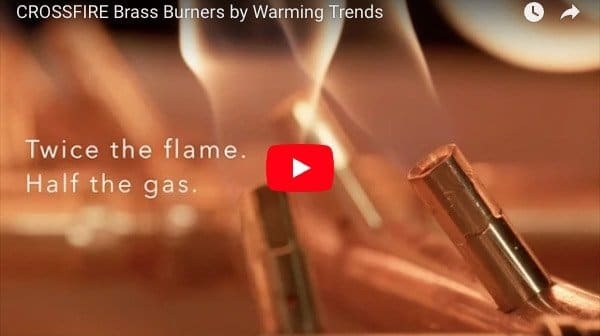 Through years of research, and especially experience, we’ve discovered that The Warming Trends Crossfire Burner is far and way the leader in terms of burners for your gas fire pit. Comprised of 100% brass construction, the Crossfire will never corrode or fail and will always produce the tallest, brightest, hottest, and the most natural flame of any gas fire pit burners on the market today! Leading the industry with a highly-engineered, precision product, the technology behind the Crossfire Brass Burner uses a specific air-to-gas ratio at the point of combustion to produce the taller, brighter, fuller flame that resembles a natural, wood burning fire. This is known as the Venturi Effect, which generates high-velocity gas flow and pulls more oxygen into the jet chamber – feeding the combination into the flame at the point of combustion. This causes the gas and oxygen mixture to expand at a high velocity as a super-charged flame, creating a beautiful flame while using less of your fuel. 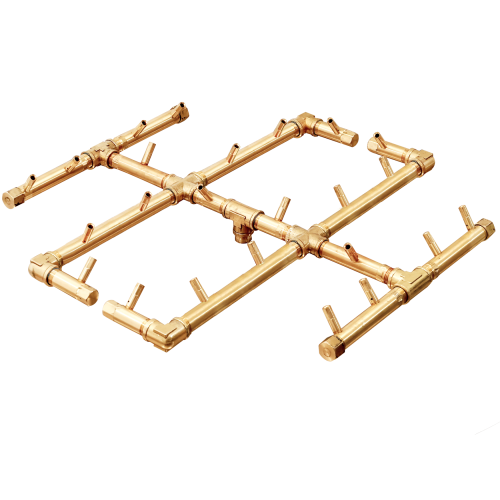 All parts and pieces of the Crossfire Burner are fashioned from brass. Unlike other gas fire pit burners made from stainless steel, brass is corrosion resistant and will not rust, which eliminates the need for replacement and results in lower cost over its lifetime. There are many factors that go into selecting an outdoor gas fire pit; the most vital is the burner. There are several key items to look for in your burner selection, one of the most important is that it is UL Listed and safety tested. This helps to ensure that the burner will light properly, burn cleanly and be safe to operate. Additionally, it is important to select a burner that is of a high-grade metal – the far most preferable option being brass. This helps for operation and longevity and minimizes any rust options—something you most assuredly want to do on a gas burner that is exposed to the outside elements. The third item is to have an ignition system that is dependable and easy to operate. While there may be several gas fire pit burners that meet the above criteria, The Warming Trends Crossfire Burner guarantees to be safe, burn clean, and look great for as long as you own it. Why Choose A Warming Trends Burner? Other “top of the line” burners are made of stainless steel or even high-grade aluminum. While this is passable for some and perhaps a bit cheaper up-front cost, a Warming Trends burner utilizes all brass components and will last a lifetime. This means a lower operating cost over the life of the burner. Since its 100% manufactured in the USA, you can rest assured it is a product that Crossfire stands behind. And it even comes with a limited lifetime warranty! We recognize you have options when it comes to the make and model of your gas fire pit burners. That is why Crossfire Brass Burners constantly top the “best of” lists and, more importantly, power the fireplaces of countless homes across the country. 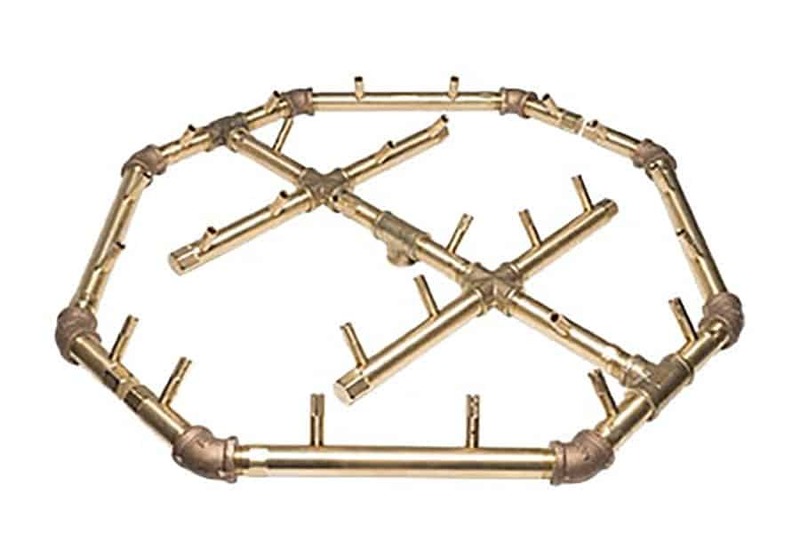 Original Crossfire Burners: The Crossfire Original Brass Gas Fire Pit Burner Kits by Warming Trends provides one of the most unique and innovative gas fire pit burner systems available. The heavy-duty brass construction ensures an exceptionally high-quality product that’s designed for long-lasting use outdoors while the unique burner system features an innovative design that combines a specific air to gas mixture ratio to produce a taller, brighter flame. Intended for use with either propane or natural gas, these gas fire pit burners use close to half the fuel of conventional gas burners because of the unique regulation system. H-Style Crossfire Burners: In order to get the most appealing look from your firepit, you need a high-quality H-burner. An H-burner ensures that the flames in your firepit are realistic, yet evenly distributed in a line. 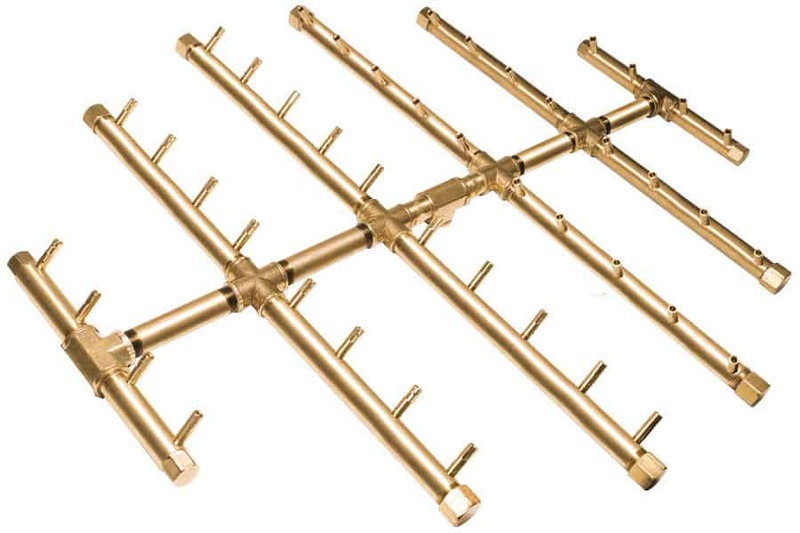 H-Style Crossfire Burners are made of high-grade brass which ensures their durability under extreme heat and severe weather conditions. This also means that they can be used both outdoors and indoors. Linear Style Crossfire Burners: Bringing the latest, leading-edge linear fireplace to the outdoors, Crossfire’s Linear Style Burners will enhance any architectural feature or landscape design. 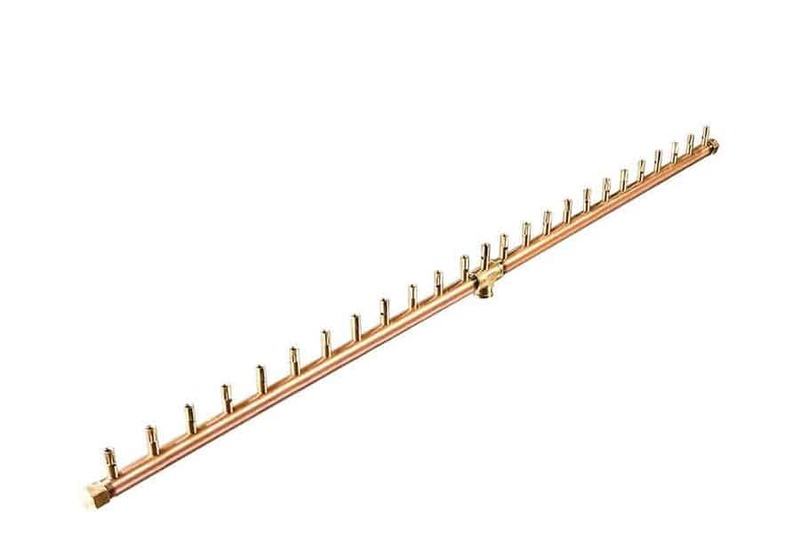 This allows you to experiment with different sizes and flame lengths. With this unique and modern design element as the centerpiece of the space, you may never want to go back inside. 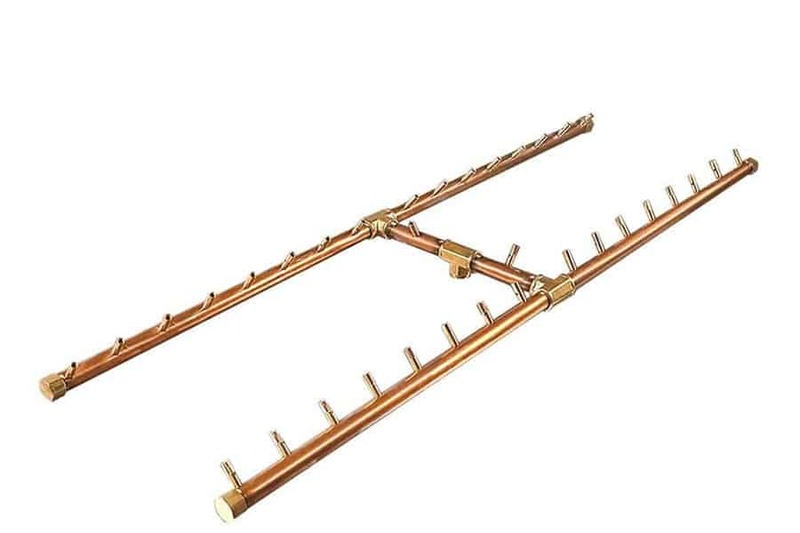 Tree Style Crossfire Burners: The Crossfire Tree-Style Linear Brass Fire Pit Burner by Warming Trends provides one of the most unique and innovative gas fire pit burner systems available. The unique tree burner features a network of “boughs” with burner ports facing inward to the center and additional jets that point to the sides to create interlaced flames that look as natural as a wood-burning fire! 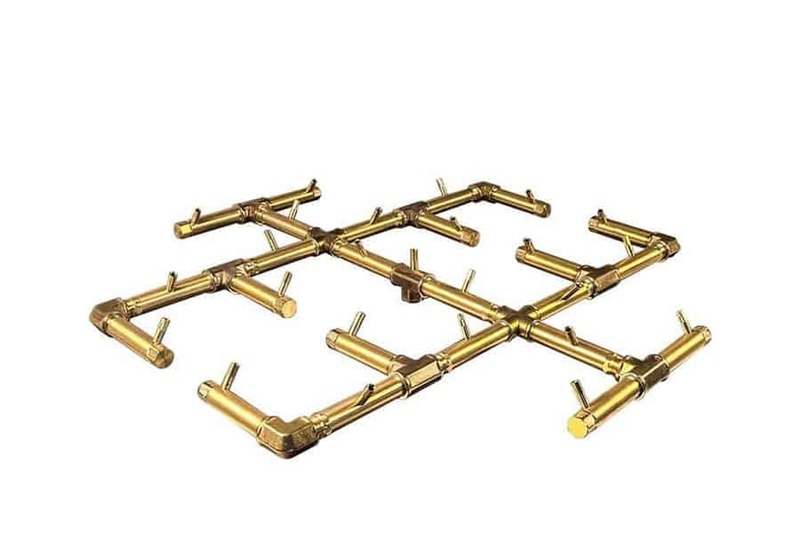 Like all other Crossfire Burners, these linear fire pit burners are constructed of corrosion resistant brass that will not rust and will last a lifetime. A great investment that will pay off for years to come! 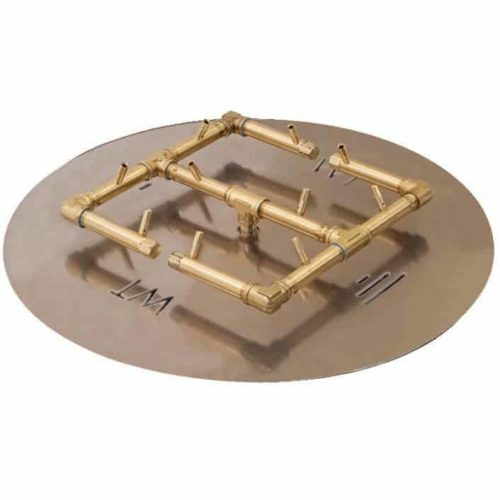 Octagonal Crossfire Burners: The Crossfire by Octagonal Tree-Style Brass Fire Pit Burner by Warming Trends provides one of the most unique and innovative gas fire pit burner systems available. The unique octagonal shape is designed for a variety of fire pit styles. And, since its available in a range of sizes and BTU ratings, you are bound to find the burner that is the perfect fit for your fire pit. 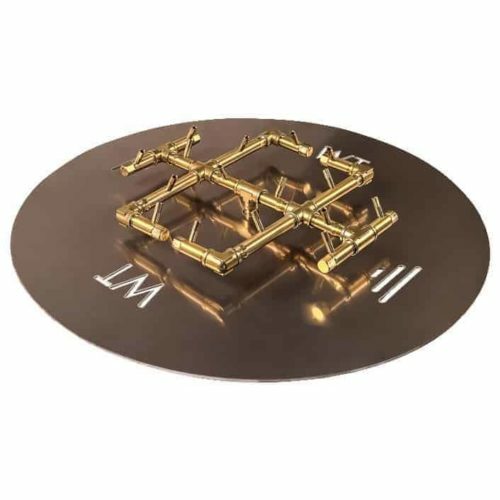 Like all Crossfire Burners, these octagonal fire pit burner are constructed of heavy-duty brass, ensuring a corrosion free product that will last a lifetime! 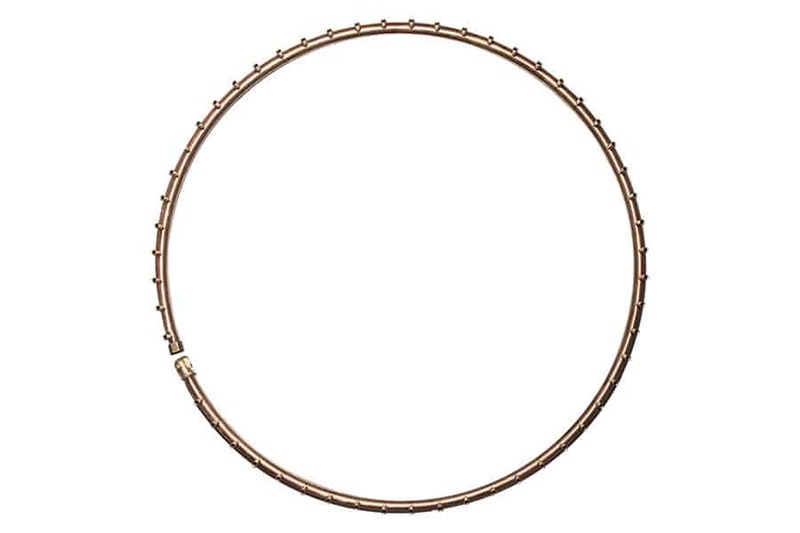 Radial Crossfire Burners: The Crossfire Radial Full-Circle Brass Fire Pit Burner by Warming Trends offers a unique full-circle shape designed for round fire pits. Since it is offered in various sizes, it is meant to accommodate various round fire pits guaranteeing a perfect fit for you and your situation. The Crossfire radial full-circle burner offers a corrosion resistant product backed by a full lifetime warranty that can be specified to accommodate natural gas or propane applications. Why Choose Crossfire Brass Burners? The Crossfire Brass Burner is a state of the art outdoor patio flame system. It was established with a specific air to gas mixture ratio which produces a taller, brighter flame while using half the fuel of conventional fire rings. This innovative technology has allowed Crossfire Brass Burners to outperform all others on the market. Montana Fire Pits is an authorized dealer of Warming Trends Crossfire Burners! We are a small family-owned company based in beautiful Missoula, Montana that is proud to be associated with the Crossfire name. When you call us, you are going to talk to a real person! Give us a call and let us help you determine which Crossfire Brass Burner is best for you and your family.